How positive I sounded last night. Roa must have heard our optimistic discussion and decided to test our sanity. He was up screaming from 12:30 until 3:30am. Up for the day at 6:00am this morning. I tried to get him down for a early morning nap at 7:45 but...it's a no go. No ECFE class for us today. I don't know how I would make it for a 9:15 class and there is no way Roa could handle it on such limited sleep. He is a bit delirious right now... laughing wildly at the Teletubbies behind me. He gets mad if I try and hold him right now. Those teeth are moving in. I'm sure that is part of the problem. Poor Bryan must be exhausted at work with only 3 hours of sleep. He is a trooper. And we carry on.... foggy and beaten.. but we carry on. Craniosacral appointment this PM with Kim. Hope she can help relax Roa. Monday, Tuesday and we are already exhausted for the week! Yesterday we had our appointment with Dr. Garcia of the Gillette Sleep Clinic. We LOVED him! He listened to what we had to say, asked us questions that matter to our family, and praised us for our attempts at helping Roa sleep. He did not start off by listing medications we could try or saying "sorry, babies with CP...." He gave us a plan to go by of a behavioristic approach through sleep restriction. It is a method that will be challenging for a few nights, but eventually, Roa should be sleeping for longer portions of time. If things don't go as planned, there are medications we can look into. It should also be noted, sadly, that many kids with CP do wake 1-2 times during the night for repositioning for a large portion of their lives. They CAN, however, learn to go back to sleep on their own. The second part of our morning at Gillette was with a speech therapist. We talked with her primarily about Roa's issues with solid food intake. She helped us set up a swallow study, which we had today. The swallow study was really quite interesting and went very well. They perform an xray and video tape as Roa swallowed barium with juice, puree, and a cookie to see how he moves a variety of food through his mouth and throat. We found out that Roa does a good job of manipulating liquid and purees in his mouth. There is nothing mechanically wrong with his feeding. He does, however demonstrate immature patterns of swallowing chunky solids such as the cookie. Long story short, Roa eats like that of a 6-9 month old baby. He needs to develop more oral control of his mouth before we move forward with solids. With the help of oral motor activities and practice with various textures, Roa will eat chunky solids in the near future!! YEAH! It was a blessing to hear that the therapists feel Roa has good oral control. That should make speech production come much easier for him, although most likely delayed like his feeding. Laurie, the OT, came this afternoon and gave us great ideas and props for oral motor activities. Roa has his OWN oral motor agenda,... he is getting a few more teeth! Poor kid. Makes all this sleep and eating work even MORE of a challenge for us all. We also had a special delivery for Reliable Medical tonight. Roa's PT, Mary has set up for us to give a test trial of an adaptive stroller, assistive seating insert for chairs, and a prone stander (for work on weight bearing, trunk strengthening). We will be testing them out and seeing if we want to go ahead and purchase these products. It was actually exciting and emotionally challenging at the same time to have the delivery man leave this things. It is not easy to think of all the equipment we may be looking at for years to come. People take for granted how easy some of us have it when attempting to simply sit or stand. We pray that much of the equipment will be short term and that our little "Powerhouse" will continue to have the drive to do things independently. Doctors, therapists, and teachers, oh my! We had such a busy week this week! Roa and I started ECFE class this Wednesday. I asked Pat, Roa's Early Intervention teacher to help Roa play with the other toddlers while I go and do the parenting component of the class. Thanks, Pat! Roa is getting two molars right now, so we have to throw that into the whole sleep confusion. The sleeping is changing, however,...longer periods of sleep and he is going down without a fight. November 2nd is the date set for Roa's first Botox injection. We are a bit nervous about this process. Botox has been around for treatment of cerebral palsy as a more intervention method than the beauty treatments of today's superficial America. Derived from food poisoning, botox in small doses can act as a muscle relaxant when injected into the tight portions of a child's body. The scary side affect is flu like symptoms- we pray Roa doesn't get hit too bad. I've attached a link about botox as an FYI. Read if interested. Speaking of needles, Daddy has been brave enough to venture in to the world of B-12 injections for Roa! I have to find a great site to link for that. .. Overall, methyl-B-12 is known to help children with neurological disorders develop better attention, boost speech development, aid with sleep, and give an overall calming effect. Roa has had 3 shots and seems to be just happier and talkative after. Well, enough for today. Have a great weekend everyone. Off to a busy week! A new week begins with appointments galore! Roa was off bright and early with Mom and Dad to get his AFOs altered a bit to fit his little legs a bit better while sitting, bending or crouching. We also had Jason, his orthotist, order him his new knee stabilizers that he will wear part of the day to help train his legs to "stand correctly" and control any hip issues. After that appointment, we were off to the general pediatrician for his 15 month appointment. All was well- his iron level is normal, heart, lungs, etc. all okay. We had a two immunizations today and Roa was a champ and only cried alittle. This afternoon, Roa and Mom trucked off to Courage for occupational therapy with Carissa and then independent swim time. Carissa worked on sizing Roa for thumb splints that I will be ordering tomorrow. She also gave us a therapeutic listening CD to try 2xday for a week or so to see if it helps Roa establish better sleep patterns. Carissa was happy to see Roa's increase tolerance of being on all fours, his tummy, and just bearing weight on his hands. Tomorrow, we have a Laurie, his home-based OT coming to visit and then, when Daddy gets home from work, we are off the the apple orchard for a photo session with our new photographer to take Roa's 15 month pics! New pictures will soon follow! I have had a couple good friends and a sister email and ask for an update in the last two days, so thought I would take a brief moment in this busy day to share a bit. Thanks, you guys, for showing interest and caring! Our doctor's appointment on Tuesday was overwhelming yet good. We met with the physiatrist who now will be working with us and Roa and talked about getting him seen at the Gillette Sleep Clinic to see if they can help Roa achieve better sleep patterns. We also discussed doing a trial of botox injections in a few portions of his body, hands and hamstrings that hinder his movement due to muscle tightness. We are in the process of being scheduled for those appts. Roa had xrays taken of his hips and also was fit for new arm splints to aid with weightbearing and leg splints to stablize knees when learning to stand correctly and balanced. We received Roa's urine analysis for the HBOT center and are looking at possible supplements that will calm the "hyperactivity" of his brain chemistry that might be causing his sleep issues. Today we began with a new craniosacral therapist. I think she is a good match for Roa and we had some nice release of tension at the session. We also are heading to Courage Center for aquatic therapy this afternoon. On Sunday, the Thayers will be hosting an Open House as a thank you to friends, family and Bryan's coworkers at API who supported us either financially or physically -by dog/house sitting throughout this last month. Hope you supporters out there recieved your invitation and can stop by for a personal thank you! Horrible night last night. Desperate for any sort of answer. Tired and depressed. Skipped OT today due to BLESSED napping! Carissa his Courage OT suggested Therapeutic Listening for increased sleep cycles. We will give it a try. Roa is getting adjusted by Dr. John today. Hopefully will help. In the meantime, researching sleep disorders and cerebral palsy. Therapeutic beds for positioning? Melatonin dosing? MB12 shots? Praying the doctor tomorrow will help us figure things out. We have settled back into our weekly routine here at the Thayer's. Roa is back at therapies and working hard. This past week, we had a therapy every day and Daddy completed the week by taking Roa swimming on Saturday. Roa's therapist's were impressed by his strength in neck and trunk and also his open hands. My favorite response had to be Andrea, his aquatic therapist, who teared up a bit! Thanks, Andrea! 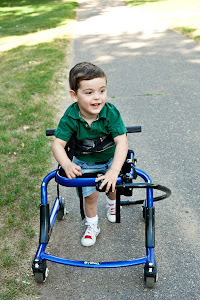 :) We are very proud of our little guy and the way he is determined to conquer his movement limitations. Roa has been just..."different" since we have been home from HBOT. He is overall more relaxed and happy. He goes down for naps and bed without a big fight. He still is getting up 2 times a night and is sometimes up for 30min - 1hour in the night, but we are working on it. We are doing some "cry it out" and some massage,...things are slowly getting better. If only he could just stay asleep. Roa also is liking the all-fours position for a few seconds and is weightbearing on his arms. He is babbling more and we are praying to hear some words someday in the near future! Eating is going up and down. We got the results from the further intolerance testing and Roa has quite a sensitive tummy! Dairy and grains are the biggest offenders. We are making changes and adjusting slowly. Tomorrow, Roa and I are off to Courage Center again to see Carissa for occupational therapy. Tuesday is a big day with a visit back at Gillette Children's Hospital to see the doctor in the Pediatric Physical Medicine and Rehab. department. We have waited a LONG time to see Dr. Gormely, who we have heard is one of the best doctors to see. 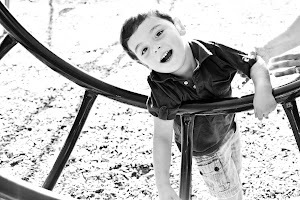 He will look at Roa as a whole- brain, body, movement, adaptive skills-and help us decide what best route to take in helping him learn to be independent. Laurie, Roa's OT from the school will be going with us to help us take it all in. September 24th is the night of our next Great Expectations Parent group/playdate. This is the group that I started in White Bear Lake to connect families of babies and toddlers with special needs. Our first meeting went very well with 6 moms in attendance! I moved it now to evenings so that we can get the working moms and also the dads to come! I am excited to see the great families I met again and share stories and resources. Time to go relax before the "night shift". Well, the Thayer family is finally home and settling into life and routine in White Bear Lake! Boy, have we missed it! Roa is active as all get-out, wanting to walk all over the house, kick his ball, and get outside in his yard. The dogs sure are happy to have their family back and have enjoyed our nightly walks again. It is nice to meet and greet all the neighbors who we missed seeing while we were gone. Many of them helped take care of our dogs and mowed our lawn. Thank you, neighbors! We had a nice weekend including a trip to the very busy, MN State Fair! Wow! Record attendance is right! Roa liked watching the sky rides and climbing on the tractors of Machinery Hill. We have decided to take a new turn in the Roa's Sleep Saga and attempt a little night weaning and "cry it out" method. We are not sure what we are battling when it comes to sleep, but we know we have to figure out how to get this boy to learn how to self soothe. We are also looking at different "therapy" beds that are available for toddlers that help with positioning. Tomorrow begins the busy work week with Roa's therapy line up, starting with Pat, his teacher through the school district. Roa loves Pat and her magical bag of toys! Roa also has OT, PT, and aquatic therapy this week. It will be exciting to hear the opinions of others as to Roa's newly developed control and strength. So, it is bright and early this great Friday morning! We moved up our last sessions to 8:00am and 1:00pm so that we can hit the road this afternoon to get home tonight! I am so very excited to see that great little house on Sun Terrace! I am going to run through the backyard with those dogs! It will be neat to see Roa's first reaction to the being reunited to Max and Molly! He misses his dogs! Last night, we had bowling fun and dinner with Jini and Murali as a "Last Hoorah". Roa laughed at the matching bowling shoes we all wore! So of course, we all had to do a little tap routine to entertain him. He thought it was the best! We will miss being this close to Bryan's cousins! They were wonderful support to have here in Madison. Roa didn't make it through the whole bowling excursion. Momma and Roa had to head back to the hotel around 7:oo and Roa hit the sack at 7:30. He got up for a total 3 times last night and slept straight through from 1:30am to 6:45am!! Such a puzzle as to why he gives us good sleep only about once a week???? We are going to start tracking EVERYTHING when we get home and start our new food plan. Eating, pooping, napping, medications, therapies, etc.... Someday we might figure this kid out! We also are waiting to hear back from the lab regarding his urine analysis and further food panel. I posted one more video this morning, "Roa and his animal train". It shows some nice strength and tolerance of new positions. I wanted to also add that I have no idea why extra youtube videos attach with my posts. Excuse the videos that don't seem to make sense, please! Day 18- New videos to share! We have posted three new youtube videos of Roa hard at work! Make sure you check them out! These videos show Roa's increased head control, tolerance of kneeling and weight bearing on his hands, open hands performing a task, and Roa's new love.... kicking balls like crazy! We are excited to share these great accomplishments with you. We have learned to celebrate EVERY little thing with the Thayers and are blessed that Roa is showing such a new "awakening". Today we also had a guided tour through a home chamber. Erin at the HBOT center was kind enough to spend some time with us to show us how the home chamber operates, answer our questions, and even let nervous Momma in the chamber to give it a test drive. Now we are considering our options. It is a big decision to make. Jen's old BRF teaching buddy, Heather stopped by the hotel today with her two boys, Nelson and Teddy. They live in Milwaukee now. The kids got to swim at the hotel and have pizza at the bowling alley while Daddy took his lunch to played tag and supervise. Heather and Jen got to catch up and talk "parenting". It was great to see them! Day 17- two more days/four more sessions to go! Roa completed 2 more sessions with Daddy today and continues to enjoy video time and a little play time in the chamber. He goes in without a fuss, but gets a little antsy as the 1 hour 20 minutes drags by. After the morning session, Roa was able to be adjusted by Dr. Charity, the chiropractor in the adjoining office to the center. He was very tired and ready for his nap, but not so cranky today so he responded well to the adjustment! It went alot better than Monday's attempt. YEAH! Hopefully, it will help him sleep a little better tonight. One can only hope! Momma got adjusted too, so we both should be feeling better. Thanks Dr. Charity for your patience with the Cranky Thayers! Life in the hotel is definitely old. I am done with hotel cooking, but am proud of us for eating out so little! That API gift basket sure helped! We are taking a slight "break" from the strict food intolerance diet and Roa and Mom are just eliminating the dairy and limiting the rest of the "bad" foods until we can get home and get cooking!! Roa development update. Hopefully tomorrow morning our video posts will be ready to add to the blog! We are very proud of Roa's head control and trunk strength. He continues to surprise us with his attempts at kicking a ball and reaching to stop it as it rolls. We also commented tonight at how in tune Roa is becoming to language. "Go get your balloon" "Where's the flag?" He is showing understanding of alot of words as well showing desires to do certain activities. Unfortunately, we also get the attitude when he doesn't want to do something, but how wonderful that he is making choices! As I write this, Daddy is in the chamber with Roa. This is after -getting home from work yesterday, going to the bank to make sure bills are paid, cleaning the house up, walking the dogs, driving the 4 hours to get here at 12:30am, sleeping 1 hour before helping me with Roa who was awake from 2:00 until 4:30am. On the way to the HBOT center this morning, he even found it possible to give Roa and I a good bellylaugh through his dry, humorous comments. I love my husband more each day. He is the strongest, most amazing person I have ever had the pleasure of knowing. Last week, when I was at my breaking point, Bryan brought out our wedding CD of "our songs" and we danced in our hotel room. Tears flowed from my eyes as I realized he truly is my ROCK, my sanity during this difficult part of Roa's life, difficult part of our lives together. Many people have asked, how WE are doing as a couple during all of this. Honestly, dealing with Roa and his developmental issues has only made us stronger. I hope that everyone has experienced a love like this in their lifetime. I feel blessed to have the pleasure of being Mrs. Thayer. Isn't it amazing that when you put it in your mind that you need to function even with limited sleep, you can do it? The human body and spirit is an amazing thing. Roa slept on a schedule similiar to when he was first born- up and down with 2 hours in between until he was up for the day at 5:15am. He was smiley, snuggly and quiet, but just awake. So much better than yesterday's Crab-fest! Wouldn't it be great to get into his little brain and see what is going on? This diet thing will take some time to work out. Roa continues to surprise me with the new skills he as acquired that we can only contribute to the HBOT. Reaching and grabbing things. Roa constantly reaches and touches my face as I breastfeed him and it just warms my heart. I've waited a long time for that. One more session today and then Bryan is here for the rest of the week.